What if… there’s an exhibit? There is and here it is, the What if Weekends Exhibit and Book Launch… and you know it’s gotta be a Weekend – right? 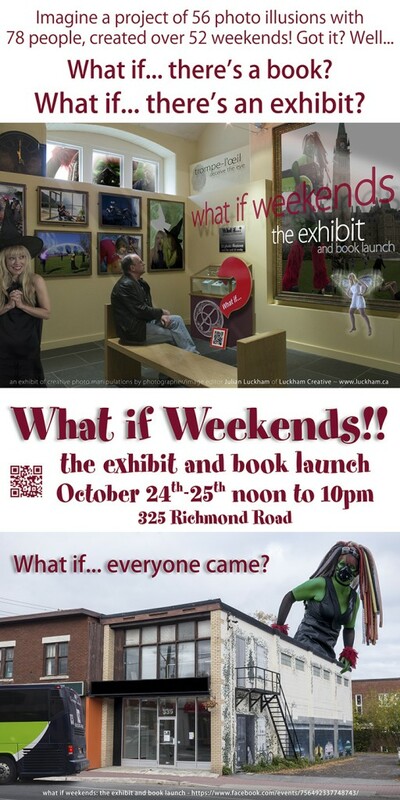 What if Weekends: the exhibit and book launch will be October 24th and 25th, that’s the Friday and Saturday before Halloween, and will take place at 325 Richmond Road in Westboro from noon to 10 each day. The event is going to be a combination book launch, costume party, pre-Halloween celebration and photo exhibit by myself Julian Luckham of Luckham Creative and John Wenzel of JJWenzel Images who will be exhibiting some of his own extraordinary work – how exciting is that! We are now an official Ottawa Food Bank Event, so please bring non-perishable food items and we will get them to the Food Bank on your behalf. I’ve invited my good friend and musician Stephen Thomas to stop by and play a few songs and he has agreed to come by Saturday and possibly even Friday as well, as if it weren’t exciting enough already! So what is a What if Weekend you may be asking. What if Weekends started in April of 2012 as a 52 week photo illusionism project that would wrap up with a book of all the illusions. Photo illusionism is a term I use in my work to convey the idea that what I create, though based in the world of photography, is not completely real. The What if Weekends project was to create an illusion with nothing but real photographs merged and manipulated in a way to create something that you couldn’t possibly photograph. The theme for all 52 photo illusions was “What if…?”. What if… you could do anything, be anyone, or go anywhere? What if you had a twin, or you could clone yourself, or… what if… you did have a Super Power? What if… anything were possible? I worked with friends and friends of friends to create these illusions, most of which worked out as planned, and some went off the rails to create something quite unexpected. It’s up to you decide what worked and what didn’t, it’s a 52 week project, so you get to see all 52 illusions! After the project was complete I created an illusion of my own, the one you see above… What if… there’s an exhibit? And what if everyone in my illusions came… in costume? And here I am, making that illusion real! Welcome to my 52 Week Photo Illusionism Project “What if Weekends”, 52 photo illusions done over 52 weeks. October 30, 2014 – The exhibit was a success… you could say, an illusion come true! What if Weekends: the exhibit and book launch was held in Westboro on October 24th and 25th and was a big success. The exhibit included 26 of my 52 what if weekend photo illusions and a few older illusions as well as some of my conventional photography. It was a lot of fun sharing my work with friends and family and the participants in my illusions. I had invited John Wenzel of JJ Wenzel Images to exhibit some of his work along side mine and he accepted, John has a huge following himself, which gave me the chance to share my work with a whole new audience which was really exciting. John does outstanding work, so to be complimented by his followers was a really good feeling. We had a good turnout over the two days and both John and I saw some of our work going out the door, before we had to pack it up again – which is always a good thing! I sold a number of copies of my book and am still getting calls. CTV’s Joel Haslam stopped by Friday morning to interview me for his show Regional Contact, which should air sometime soon, I’ll update this post as soon as I know when. My good friend and legendary Rock ‘n’ Roll photographer John Rowlands came by to see my work! I’ve been a fan of John’s since I was a kid, before I even knew him. I had a photo of David Bowie (The Archer) on my wall when I was a kid that John had taken, and I only discovered this a couple of years ago. I love a lot of John’s work including shots of The Beatles, The Rolling Stones, Bruce Springsteen and many many more, including of course David Bowie. To have John at MY exhibit admiring MY work and complimenting me was more than I had imagined. Thanks for coming John, and for hanging out with us for wine and muffins after!! As I mentioned I met a lot of new people through fellow photographer John Wenzel, one of these was another photographer who saw the poster I put up about my next project, “Father Daughter Perspective” a new book I’m working on with my daughter Caitlin. The idea of this book is to share the special bond we have, through words and photography, our different perspectives on being a Father, a Daughter, an able bodied person and a person with a disability, an how easy it can be making ordinary things special. This fellow who saw the poster sought me out at the gallery to tell me that he wanted to purchase my book when it becomes available. He wants to give it to his daughter for her Birthday next year to inspire her to want to go out on photo shoots with him. This was so very cool to hear as that is the very reason Caitlin and I want to do this book, to encourage bothe parents and their kids to do things together, and for Caitlin to inspire other kids with disabilities! To sell a copy of my new book that so far only has a front cover… no, that wasn’t part of the illusion, I guess it’s taken on a life of it’s own… very cool! But, back to the current book… it’s available! If you are in the Ottawa area and would like a copy, get in touch I have a few on hand, otherwise check out my books page where you will find links to both my first book and What if Weekends.